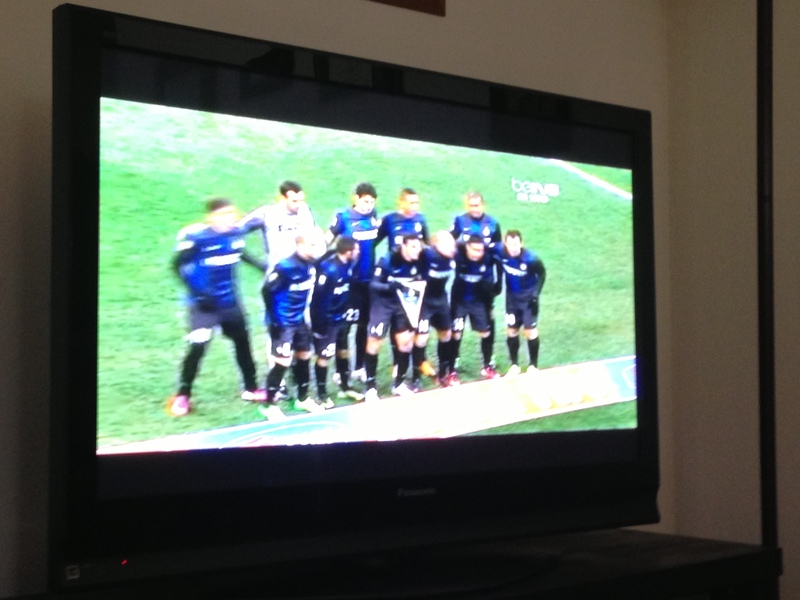 In case you are wondering what the Derby della Madonnina is, allow me to inform you. Like I just said, this is Italy’s fiercest fútbol clash, starring Football Club Internazionale Milano S.p.A. aka Inter Milan aka Inter and Associazione Calcio Milan aka Milan. This was my living room right before the derby began. 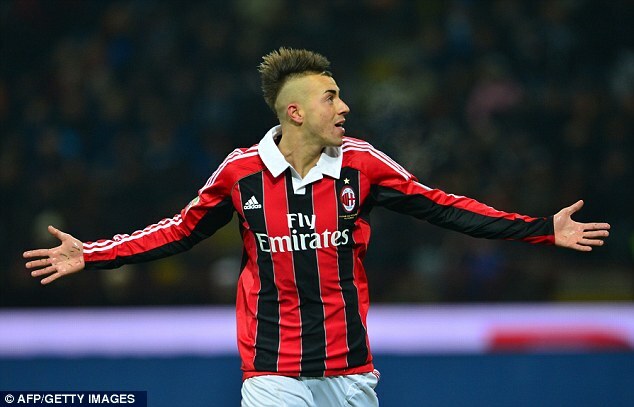 Inter started off strong, until Milan’s 20 year-old forward Stephen Al Shaarawy (this boy puts my eyebrows to shame) opened the scoring with a well done boot finish in the 21st minute, assisted by a pass from Prince Boateng. Just analyze that hair (and those eyebrows). 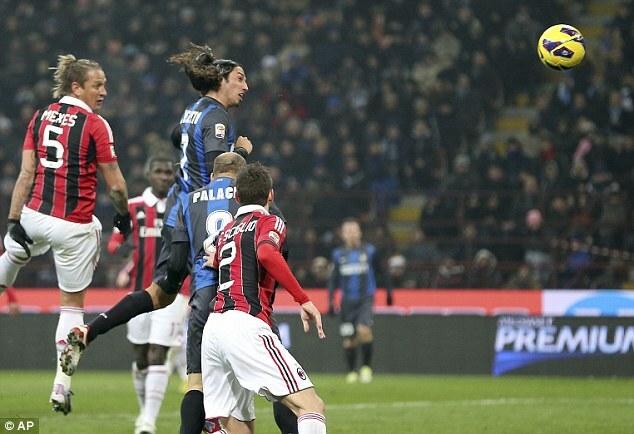 The first half also contained a continuous battle between Milan’s Mario Balotelli and Inter goalkeeper Samir Handanovic. Balotelli was very close to scoring on minutes 15, 27, and 29. He kept flirting with the net, but Handanovic was acting territorial and would not allow the striker to seal the deal. Again, Handanovic blocked Balotelli’s free kick in the 39th minute. The juicy brawl stuff began in the 41st minute, when Milan’s Riccardo Montolivo and Inter’s Esteban Cambiasso went diva on each other. Of course, their bromantic partners all wanted to put in their two cents, but the referee stopped them short. The second half began with a nightclub-like scene. San Siro was suddenly covered in fog, and I could barely see clearly for a few minutes. The fog primed memories of the steam in Las Vegas’ TAO Nightclub. However, instead of go-go dancers, there were 22 fútbol stars in the pitch. Are we in Las Vegas? No, we’re in San Siro. Inter stepped up their game in the second half. Again, they started strong, and didn’t stop. Midfielder Fredy Guarín almost scored an equalizer, but Milan goalkeeper Christian Abiatti did not let him get away with it. But Ezequiel Schelotto did get away with it, scoring the much anticipated equalizer in the 71st minute with a fantastic header. I would have gotten a concussion, but Schelotto’s header got the equalizer. Awww. 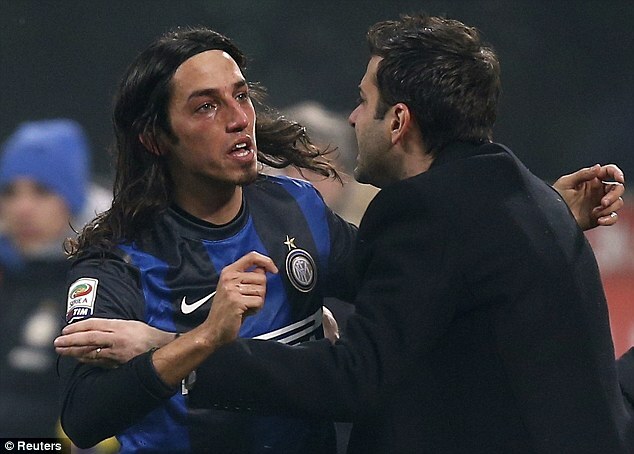 Schelotto’s tears of joy. Good job, sir. The Milan boys were doing some physical bullying tonight. Mexes, Muntari, Montolivo, and Zapata were each booked with yellow cards in minutes 12, 31, 49, and 89, respectively. Only Ranocchia and Juan from Inter were awarded yellow cards in minutes 34 and 43, respectively. Ok, let us go on to the next derby, the one at the Parc des Princes. The greatest French Ligue 1 rivalry is the one between Paris Saint-Germain F.C. 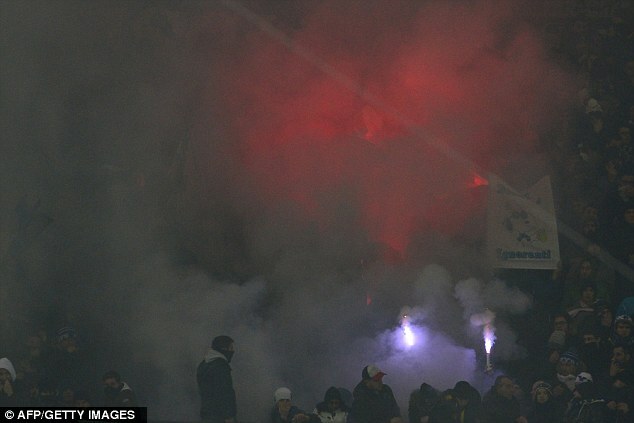 (PSG) and Olympique de Marseille (Marseille). Tonight’s meeting between these two giants, also known as Le Classique, was especially notorious for two reasons. 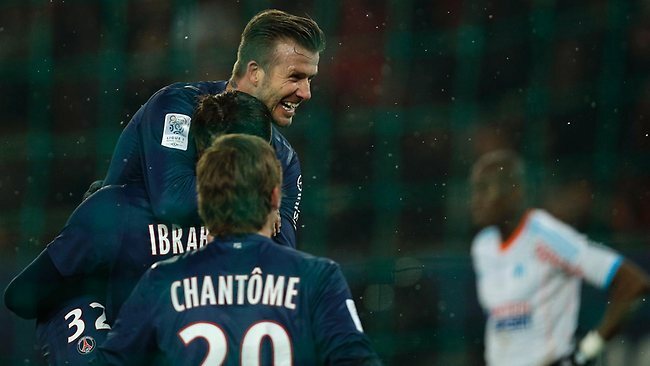 First, former LA Galaxy midfielder and overall fútbol star David Beckham was to make his first active appearance for PSG. 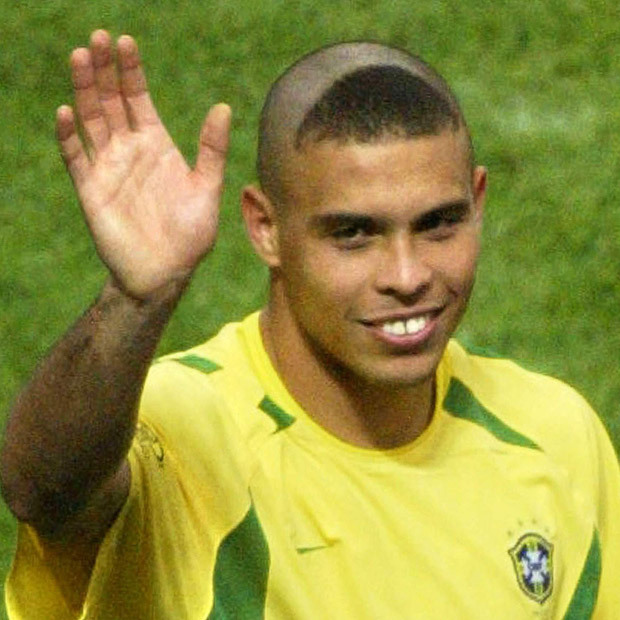 Second, PSG was to pay a tribute to the legendary Ronaldo Luís Nazário Lima (Brazil’s Ronaldo). 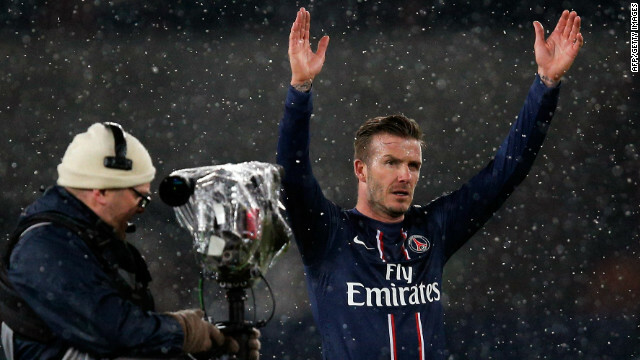 We’ve seen David Beckham playing in England, Spain, USA, Italy, posing for the H&M campaign in underwear, and tonight we saw him debuting for PSG in the last 14 minutes of Le Classique. He sure did that debut justice. In the 11th minute, Marseille’s own poor Nicolas N’Koulou committed social suicide and scored an own goal, granting PSG an early lead. That lead was reinforced by no other than Beckham’s magic pass to Jeremy Ménez’ magic pass to Zlatan Ibahimović’s knee’s magic pass past the Marseille goalkeeper Steve Mandanda, which sealed a PSG’s 2-0 victory over Marseille. Prior to Le Classique‘s kickoff, PSG paid a tribute to Brazilian legend Ronaldo for his large number of accomplishments. Ibrahimovic handed Ronaldo a PSG shirt with his name on it. I seriously wanted to shed a tear. Sadly, I can’t find any pictures of this historic moment. Ronaldo won the World Cup twice in 1994 and 2002. Back in 2002, I was a little 15-year-old little fútbol fan. My sister and I secretly woke up in the middle of the night to watch the final between Brazil and Germany, which Brazil won. I still remember Germany goalkeeper Oliver Khan crying by the goal post. Ronaldo also won two Ballons d’Or in 1997 and 2002. In 2006, he overtook Gerd Müller as the World Cup all-time scorer. In the peak of his professional career, he played for giants Barcelona, Inter Milan, Real Madrid, AC Milan (MAJOR example of backstabbing! ), for a total number of 280 goals in 384 appearances. I can go on and on telling you about his long list of his magic feats, but it will take forever. Oh, he also grew some chub, which he recently lost (go Ronaldo! ), and got rid of the look below. Congratulations, Ronaldo!!!!! Well, I’m off to get ready for a date. I hope he doesn’t take me to Wendy’s. Only Busquets can get away with that.